The $8,000 New Home Buyer Tax Credit (along with the Cash-for-Clunkers) may have dominated the headlines recently, but some energy efficiency Tax Credits offered by the federal government could be even more useful for the average homeowner. You may be eligible for a tax credit equal to 30 percent of the cost of materials (up to $1,500) for certain products purchased between January 1, 2009 and December 31st, 2010. Advanced Main Air Circulating Fan No more than 2% of furnace total energy use. Stove which burns biomass fuel to heat a home or heat water. At least half of the energy generated by the ?qualifying property? must come from the sun. Homeowners may only claim spending on the solar water heating system property, not the entire water heating system of the household. 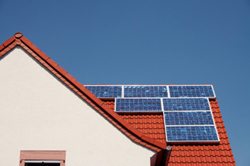 Photovoltaic Systems Photovoltaic systems must provide electricity for the residence, and must meet applicable fire and electrical code requirement. Residential Small Wind Turbines Has nameplate capacity of not more than 100 kilowatts. Efficiency of at least 30% and must have a capacity of at least 0.5 kW. If you would like to discontinue receiving emails from this agent, click here. This email is intended for a recipient with an existing business relationship with the sender. The source email server is managed by Reliance Network, LLC. If abuse is suspected, please contact Reliance Network via the following URL.